SNAFU! : How about trying a Caesar type USMC solution? A 155mm cannon on the back of an MTVR? They're considering it! How about trying a Caesar type USMC solution? A 155mm cannon on the back of an MTVR? They're considering it! AM General highlighted its new mobile fire support designs at the 2019 Marine West Expo, being held aboard Marine Corps Base Camp Pendleton. The new designs reflect an expansion of the technologies incorporated into the company’s 105mm Mobile Weapon System Hawkeye concept, which the company describes as ‘the most highly maneuverable self-propelled howitzer in the world today’. The Hawkeye design integrates an M20 105mm cannon on the company’s M1152A1w/B2 HMMWV, and includes a digital fire control system and onboard communications that eliminate the need for surveying firing points prior to conducting fire missions. According to Robert Quinn, senior manager for marketing and communications at AM General, the Hawkeye demonstrator was presented at Marine West because of its potential role in providing mobile fire support for the USMC. Some observers believe that the marine corps’ 2018 removal of the 120mm Expeditionary Fire Support System lightweight towed mortar from its combat units has created a gap in the ability to delivery close range, rapidly responsive fire support. Quinn noted that Hawkeye could certainly provide that type of fire support capability. He said that one of the keys to the Hawkeye design was the recoil system, which allowed the 105mm cannon to be mounted on a lightweight HMMWV. He noted that the same recoil concept was also used in the development of a more recent fire support demonstrator. Dubbed Brutus by AM General, the new demonstrator integrates the same 155mm 39 calibre length cannon used on the M777 series towed howitzers on the rear of a 5t FMTV truck. The system was fired during demonstrations at Fort Sill, Oklahoma late in 2018. ‘We have been able to emplace and fire in less than two minutes and have been able to displace in less than 60 seconds’, Quinn said. ‘So the total time to emplace, shoot and displace is less than four minutes’. In addition to the Hawkeye and Brutus demonstrators, he pointed to USMC interest in a highly mobile 155mm design, with ongoing discussions about the possible integration of the same 155mm cannon tube on the rear of a USMC MTVR truck. 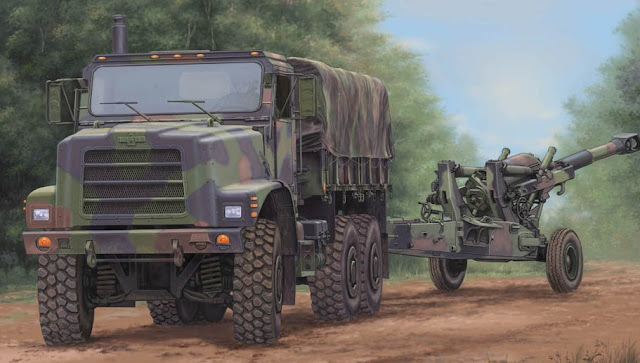 Along with its cannon fire support designs, AM General highlighted its Enhanced Tactical Fires – Support (ETF-S) vehicle kits, which convert an M1097 or M1152A1B2 two-man HMMWV into an artillery support vehicle featuring enhanced safety capabilities for soldiers. Good news! If they buy it I'd be thrilled. How long has it been since the USMC had self propelled artillery?